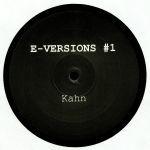 Review: Mark E turns over duties on the latest E-Versions 12" to one of his most celebrated and respected namesakes, Mr Mark Seven! Fans of the Parkway Megamix from Mark Seven should be eminently familiar with "Dial Theory (Tony's Slice)", which is where Mark E first heard it. "A lot of telephone conversations, a lot of pleading, digging, sweat and tears" later and Parkway's Mark revealed to MERC's Mark it was an attempt to recreate a live mix by Tony Humphries he heard on Kiss cutting 2 copies of the phone conversation back and forward forever. All this talking has led to the track featuring here, a serious edit from MKVII indeed! The flipside acid cut, "Case Study 9" is just as potent too!